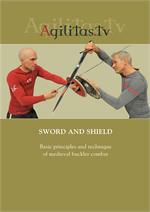 Royal Armouries MS. I.33 is a 700-year old, beautifully illustrated masterwork on the art of sword and buckler combat. 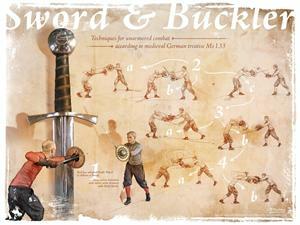 Renowned I.33 researcher, swordsman and professional artist Roland Warzecha honors this manuscript's unique blend of martial and artistic magnificence in this beautifully rendered collector's poster, illustrating a series of potential actions pitting Halfshield against Sixth Ward. Designed with the artistic spirit of old manuscripts and explorer's journals, this 14 X 28 full-color poster is printed on a heavy, durable cardstock, making it ideal for framing.